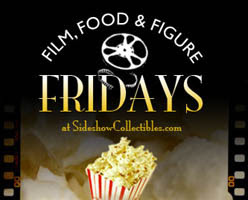 Win Sideshow's Obi-Wan vs. Anakin Star Wars Diorama, a Star Wars Episode III Widescreen DVD, and a BIG BAG of popcorn. This month's contest will start at 9am PST on Friday, October 19th, 2007. All entries received before then will be disqualified! Throughout the day, Sideshow will be collecting entries via the form on their website. One random winner will be chosen from all participants at 6pm PST. The winner will be contacted via email. Good luck! Click on the "Win Collectibles Here!" link in the sidebar for access to the entry form and more info!